Ladybird Beetles, or Ladybugs as I grew up calling them in North America, are quite well-known beetles, but some people may be surprised to learn that you’ll find these colorful beetles in the deserts of Sinai. Ladybirds are red, yellow, or orange colored beetles with small black spots on their wing covers. They have small dome-shaped bodies and six short legs. Contrary to popular belief, the number of spots do not indicate age but rather a specific species. Both of the beetles pictured above are Seven-spotted Ladybird Beetles (Coccinella septempunctata), one of the most common. I have also seen Eleven-Spotted Ladybirds (Coccinella undecimpunctata), pictured below, on caper plants in the wadis around Dahab. When threatened, adult ladybirds release a yellow substance from a joint on their leg that is distasteful to predators and convinces them to find their next meal somewhere else. The Bedouin in Sinai call Ladybird Beetles ‘uwaynat umm sulayman, or “the eyes of Solomon’s mother”. In traditional folklore in some cultures, Ladybird Beetles are thought to bring good luck. Have ladybirds brought you any luck in the Sinai? Zalat, S., & Gilbert, F. (2008). 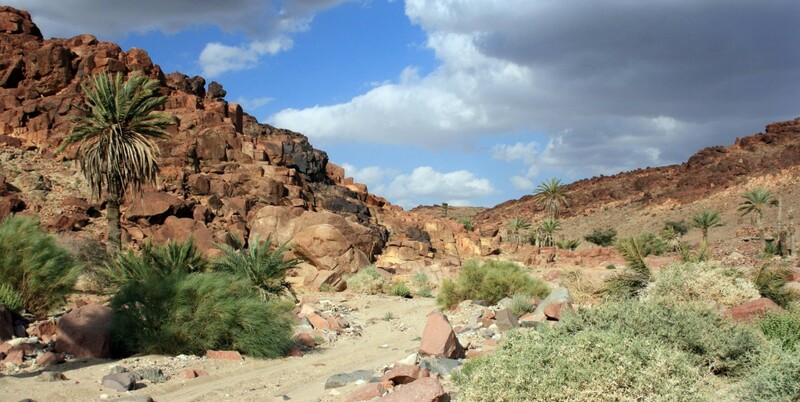 Gardens of a Sacred Landscape: Bedouin Heritage and Natural History in the High Mountains of Sinai. Cairo: The American University in Cairo Press.